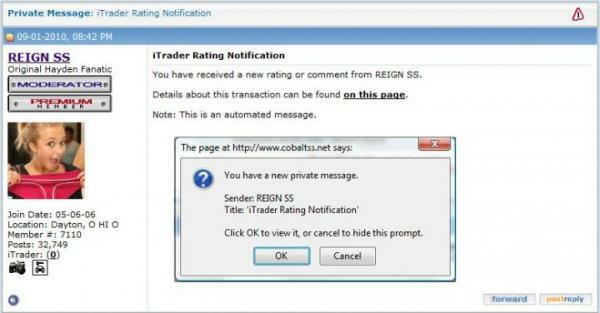 Please read for important information regarding the iTrader feedback system. 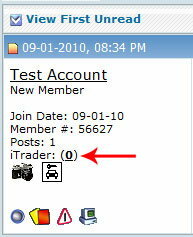 We've had the iTrader system in place for some time but people are not using it as it should be. I hope you find this walk-through helpful in navigating this new and exciting forum feature. Please feel free to post up any questions you may have about the iTrader system here. In my experience, it's some of the AA's that don't bother to leave feedback. They're happy to receive, but, give **** all back. I should leave negative feedback for Triple Filtered, but that (quit with the bypasses ) has got 3 different usernames. Last edited by Kieran_Burns; 21 April 2011 at 09:19 PM. Not sure why it has to be made so complicated? Deal URL being a required field is pointless imho. Visit Aztec Performance Ltd's homepage! On the contrary, it is the most usefull part of the process. What would stop me and all the other members leaving all your competitors lots and lots of feedback for no reason at all without it? Also, how would we know what the feedback was actually for in case of later dispute? Could feedback only be left through the original deal thread (instead of clicking on the iTrader #) thus negating the need for it? 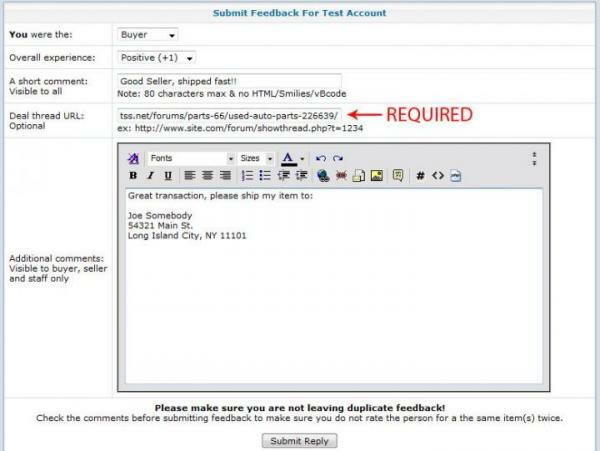 Similar to the way eBay feedback is left. I am afraid not in the current edition of the plugin, no. I am sure it will evolve nicely as time goes by, but for the moment this really is as good as it gets. Fair do's, just a thought. As you say hopefully it will evolve, making it easier to use, thus encouraging more people to use it. May be better or may make no difference but the main thing is you have listen and tried to make it easier. The only issue I have is if someone sends you a pm saying they have something you might be interested in then you can't use it as the deal thread thus making it impossible (as far as I can tell) to leave feedback or rate the transaction. I have this problem right now. I contacted a user on here asking for parts that I guessed he would have. He did have them and I paid for them yesterday, now how should I give him feedback? Post something in wanted and write it is already bought or use one of his sales threads? Or is this transaction irrelevant as there was never anything posted on here. If you guys want to do deals outside of the market place there is nothing we can do to help you, sorry. So what happens when anyone sends a PM to an AA asking for parts that have not been specifically listed for sale on here but you know they have? Do we just put the link from the Traders Contact Area, will the trader have to list specific items for sale or will the buyer have to do as suggested and put up an already fulfilled wanted ad? ....or what if the for sale item appears in someones signature? For example the walbro fuel pumps in yours? Non-paying members cannot advertise sales in the forum nor link to sales out of it. If the Trader decides to make sales out of the iTrader system, that's his choice, he won't get the feedback. I am aware that AA's (and site owners) can advertise in their sig's, thats why i asked how you leave an iTrader feedback for it. I presume you just link to any thread where the AA has posted and in the detailed description part of the iTrader feedback explain that you found the parts in the AA's sig and not a specific for sale thread. The point i am trying to make is that whilst you and I and many others would happily spend time looking for the correct trader announcement thread (or one sufficiently relevant in the for sale section) many more wouldn't and hence the feedback would not get left which is what you guys are trying to avoid happening. IF AA's are allowed to advertise specific items for sale in their sig then surely we need to be able to give appropriate feedback for it. That right there, nail on the head. Folk are happy to receive it, and your money, but can't even be bothered to return feedback. Boils my bloody **** that does. I have sold it least 30 odd parts over the past 6 months and check my feedback. Has anbody been offered a silver bonnet bumper and front wings for a 1994 subaru imprezza. Had mine nicked and stripped this morning in Leeds the scum bags . Any info would be appreciated. Been trying to leave feedback but it seems access has been withdrawn, cannot even see my own feedback anymore. Yeah me too. Any reason for this? Will look into this right away guys. Same symptoms as before Stu.